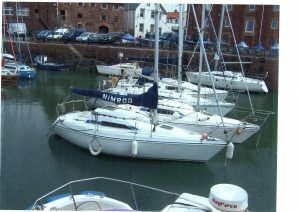 Nimrod is my Hunter 272 built 1992 . She is a bilge keeler with self tacking Jib. She is based in North Berwick and is being lifted out October 2018 . She has a new rig 10 years ago and the Mainsail and foresail are just 4 years old ( with little use since then). At the moment she requires a clean hull and anti-fouling which will be done over the winter.